Background: Early developmental conditions can influence within- and among-brood variation in the timing of hatching/birth, which has been shown to affect offspring survival, growth, and reproductive success across a range of species. Problem: How does within- and among-litter variation in the timing of birth affect offspring growth and survival in Egernia whitii? Organism: Egernia whitii, a long-lived social reptile that exhibits within-litter variation in its timing of birth (i.e. birthing asynchrony). 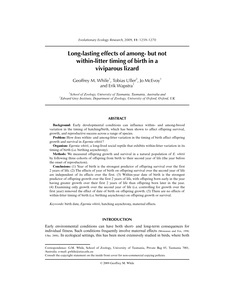 Methods: We measured offspring growth and survival in a natural population of E. whitii by following three cohorts of offspring from birth to their second year of life (the year before the onset of reproduction). Conclusions: (1) Year of birth is the strongest predictor of offspring survival over the first 2 years of life. (2) The effects of year of birth on offspring survival over the second year of life are independent of its effects over the first. (3) Within-year date of birth is the strongest predictor of offspring growth over the first 2 years of life, with offspring born early in the year having greater growth over their first 2 years of life than offspring born later in the year. (4) Examining only growth over the second year of life (i.e. controlling for growth over the first year) removed the effect of date of birth on offspring growth. (5) There are no effects of within-litter timing of birth (i.e. birthing asynchrony) on offspring growth or survival. birth date, Egernia whitii, hatching asynchrony, maternal effects.